Nothing gets me through the long winter days better than a perfect brewed coffee – today I’m sharing a how to blog post on how to brew a flat white, the last coffee trend that’s taking over the nation! To be honest with you, I’ve probably taste tested over a dozen coffee makers. Coming from a Caribbean island where coffee is more than a drink – where coffee is a ritual and a lifestyle – I know a thing or two about coffee. How it should be brewed, how to extract the best taste, how fresh beans are incredibly important, and so on. I’m picky with my coffee and even pickier with the amount I drink. There are days when I wake up needing just a cup to get me started and other days, an entire carafe is what I need to pry my eyes open and get the day started. 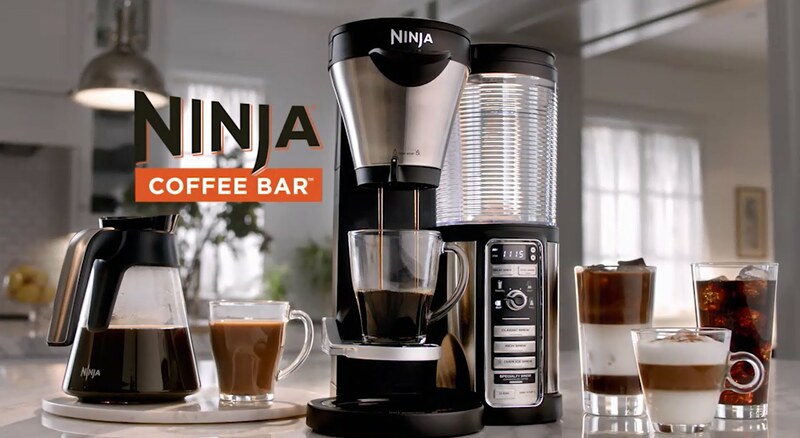 That’s why I’m loving the Ninja Coffee Bar™ – the latest and greatest from Ninja Kitchen. Not only does it brew a cup, a travel mug, a half carafe, and a whole carafe – but it also brews espresso for specialty coffees as well as the perfect brew for iced coffees. 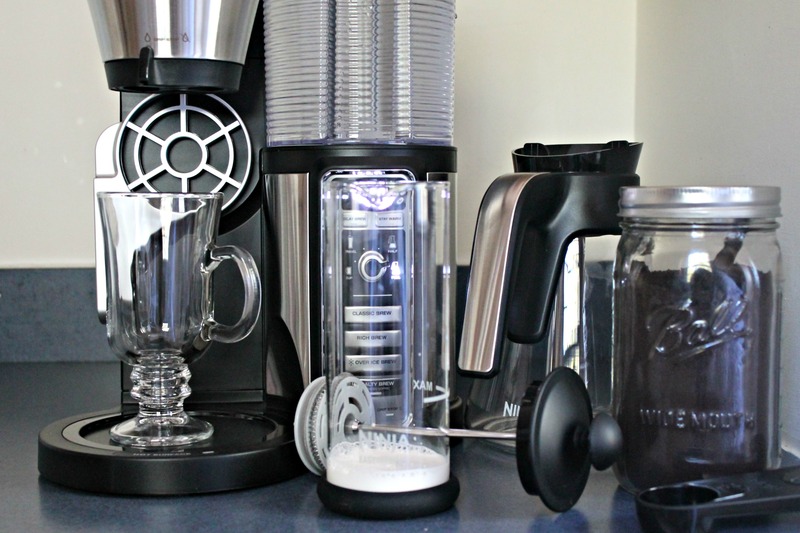 Basically, the moment the Ninja Coffee Bar™ sat on my counter, I got rid of any other coffee maker in my kitchen. Previously, I owned a coffee maker that brewed entire pots of coffee, plus an electric espresso maker for when I needed just one cup. As you can see, this new coffee bar by Ninja minimized the appliances in my kitchen, giving me even extra counter space! Now, like the post title says, today we’re chatting about a flat white. Do you know what a flat white is? I’m assuming you do, as even the most popular coffee shop in the US has gotten behind this new coffee beverage and serves up a version of a flat white. I spend a good amount of money on flat whites when I’m in town, as local coffee shops also make them – they are delicious and just the right amount of caffeine I need. What is a flat white? A flat white originated in Australia and is made by pouring a small amount milk foam over a shot or two of espresso. It’s basically like a cappuccino or latte, only much smaller in size and the proportions of coffee to milk are much higher, thus the coffee flavor is more pronounced. It’s typically served in a ceramic mug but today I served it in a glass mug so you can appreciate the gorgeous color. You can read more about flat whites in The Kitchn and Yahoo Food. A flat white is nothing more than a smaller in size latte with a milk foam that lets the coffee flavors shine through. Heat milk and foam using frother or by shaking it in a jar until foamy. Pour foam over hot coffee and sprinkle with cinnamon. Serve immediately. Disclaimer: Ninja Coffee Bar™ provided me with a sample of their appliance with no obligations to post about it. My experience was fantastic and I’d recommend this product 100%. Thank you for supporting brands that make it possible for me to bring you new and exciting content! I should have read this earlier–I am addicted to flat whites! But mostly I’m just lazy and while I have an espresso machine, it’s so much easier to just have someone else make it for me. 😉 That Ninja is a thing of beauty–what fun! My fav is always sweet and light! My favorite coffee drink is Espresso. I love a white chocolate cappuccino. I love french vanilla cappuccinos! I love Starbucks Breakfast Blend Thanks for the chance! I’m a purist. My favorite is dark roast black coffee. I Love Hazelnut Coffee & Chai Spiced Coffee. If it’s been a super long day a splash of rum! Just had a Christmas baby, need as many caffeine delivery systems as possible! I love a coffee nudge! Or a vanilla latte for something tamer. I love all coffee drinks but my favorite is just the basic brewed coffee with cream and sugar. i like a white chocolate mocha. it is my favorite coffee drink. I like French Vanilla Iced Cappuccino’s! I like to get a Vanilla Latte. I like almost all coffee drinks, but I’m partial to both espressos and lattes. I do love the current famous coffee retailer’s holiday spice flat white though as a nice alternate choice. Would be great to be able to make that at home. I hate to admit it, but it is just plain black coffee. It might be the time of the year but I like eggnog latte. I love flavored coffee! Thanks so much for the chances to win. I could have used this yesterday when ELove was closed ? Great recipe! I’m amazed how many people have never heard of a flat white! Iced Vanilla Coffee is my favorite coffee drink right now. My favorite coffee drink is cappuccino. My favorite coffee drink is caramel mocha thanks for the chance! My favorite is Caramel Frappucino. I work for said “most popular coffee shop” and have to agree that flat whites are delicious! I love that the ratio of espresso to milk gives a more pronounced coffee flavor. It’s one of my favorites! I love any vanilla flavored coffee drinks. I love a good iced cafe mocha drink! If it involves coffee, it’s ALL GOOD! I love a good latte. That Ninja Coffee Bar is pretty impressive! Any as long as it has some caramel. Yummy. This thing looks amazing, I didn’t even know Ninja made coffee machines, my goto coffee is hazelnut! Iced coffee with coconut water!!! Or a cashew milk latte! I love a cafe mocha!!! I like…uhm…espresso shots with a little cocoa creamer—does that have a name? My favorite coffee drink is a Pumpkin Spice Latte. I like plain, black coffee…but like, really good coffee. French vanilla, classic but for a good reason! Just a black bitter and smooth dark roast! i love iced hazelnut lattes. I like vanilla lattes the most. My favorite is Cappuccino with whip cream. My favorite is eggnog latte. I love me a mocha… in any way (raspberry, caramel, regular, with french vanilla, iced….) yum, just give me the chocolate! i like the Latte coffee. i have an electric frother i found at the second hand store. i won’t go to starbuckles any more now i found this gadget! i would love the ninja. been lusting over at the local store. Love caremal cappuccinos! Would love to try it with this machine. Flat White has been my favorite for years, too. I also love the Cafe Cubano at a local place. I love many kinds of lattes, as well as just a quality cup of black coffee. In the past, I used to get the Caffe Mocha on a regular basis. But since I’ve cut back on the sugary drinks, I mainly drink black coffee. I sometimes will add a dollop of coconut oil or butter. I’ve tried the flat white at Starbucks and wasn’t impressed. Your recipe and photo above looks much better. The description of adding small amount milk foam over a shot or two of espresso does sound good if I can find a good coffee place. Since my husband has collected several types of coffeemakers including the siphon and moka, we’ve been experimenting with many different ways of preparing coffee. I’ve never heard of the Ninja Coffee Bar™ . Looks cool. I bet we would have fun with it. Depends on the weather, in the summer months I love a mocha frappiccino but in the winter months I love a nice hot cup of coffee with cream and sugar. I love vanilla lattes the best. Anything Like a Java Chip or Mocha Frapuccino! I love coffee and this is amazing! Thanks for sharing and good luck to all! My favorite is from a local place – a Whatchamacallit Frap. My favorite is a Caramel Machiato… either cold or hot. My favorite coffee drink is actually a flat white. I try to make it at home but have not perfected it yet! I love Lattes, followed by cappucinno. A gingerbread latte or just a plain latte! I like vanilla latte, I don’t drink a lot of coffee though. I don’t usually do coffee flavors, but this Flat White recipe makes me want to try it! I love an iced coffee!